PRP or Platelet Rich Plasma is used to cure hair loss as that is the most effective and safe treatment. Similar to vampire facelift to rejuvenate the skin, PRP for hair promote hair growth when injected into the scalp. At Leeds, there are many clinics that help patients suffering from hair loss to recover fast with the help non-surgical procedures such as PRP therapy. PRP is concentrated blood plasma that contains about 3 to 5 times the number of platelets found in normal blood. PRP is used to facilitate wound healing, however, studies suggests that it can also serve as an effective and safe treatment for treating hair loss in both men and women. PRP is the same treatment that is done on the face as vampire facelift to reduce acne scars, wrinkles, lines and helps in building collagen. PRP therapy is suitable for those who have hair thinning issues or suffering from pattern alopecia. For best results, eight sittings are required. The therapy is performed in three stages; first the amount of blood is taken from the patient and centrifuged. Fraction is then removed and kept with most platelets. Secondly, to activate the wound healing process the scalp is stimulated that must be complete in a single needle. For the activation step 100’s of punctures are made with the use various needles. Thirdly, the platelet and growth factor rich fragment are then injected into the scalp. It is true that PRP therapy yields great results but it is not for everyone especially for the people who have lost all hair because it does not help in growing new hair on a bald area. Along with this treatment one can take other medications such as propecia and minoxidil. The physician may also alternate between PRP and stem cell therapy as a combination procedure that offers great results. PRP is a totally naturally procedure and does not use any other derivatives or materials. Today, about 70% of men in Leeds are suffering from hair loss. For few it starts at an early age but most men experience hair loss by the age of 60. PRP therapy is innovative non-surgical treatment that is suitable for men and takes only 80 minutes to complete. PRP therapy offers an opportunity for women who are suffering from hair thinning or female pattern baldness. However, the results will vary from patients to patients. Known for providing various surgical and non-surgical procedures, at Leeds you can find many specialized clinic to treat hair loss. Nu Hair Clinic offers PRP therapy to treat severe hair loss. Our clinic has capabilities and expertise in providing hair loss treatment. 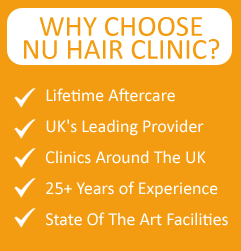 So if you are from Leeds and suffering from hair loss, Nu Hair Clinic is there to help you.